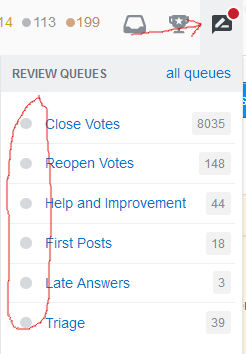 After clicking on the review icon on the top bar when the red dot is showing, there is sometimes no red dot for any of the review queues. This happens frequently. I suspect that this could be because I finished my daily low-quality and suggested-edit review quota, but these are in need of reviewers still. In that case, the solution would be to disable the red dot on the top bar for users who can't do more of those reviews today. In your screenshot, my money's on the Reopen queue being the culprit: the "danger zone" for that queue is currently 150+ tasks. 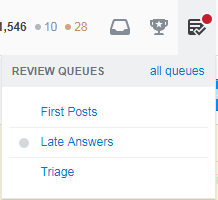 Heck, if you keep the page open for a bit you might even see new reviewers pop up in real time, thus illustrating how quickly some of these queues can move (particularly when the red dot appears). A proper fix for this would probably involve learning from some old HVAC tech: adding hysteresis such that, for a given queue, the indicator lights when the setpoint is exceeded or was recently exceeded. I thought it was supposed to be solved by now, but it seems like it's still showing red dot when no available queue is red. At least one of your available queue is red. This is not what I saw today. Seem to be solved for me, no red dot showing today. Not the answer you're looking for? Browse other questions tagged bug top-bar .